Food trucks and pop-up food vendors are all the rage these days, but a full-service taco truck, an ice cream truck, or a hot dog cart are all very different businesses. However, they all have something in common — a food vendor license. A food vendor license is a legal permit that allows you and your business to sell food in a certain municipality. The process to get your license can vary depending on where you need one. From there, it’s a matter of applying for the right license and passing any applicable inspections. Food safety law has many levels to it. While the FDA may govern food and drug processing on the federal level, many of the laws aimed toward food vendors are from the state and local government level. This means that location is a big factor in what licenses a food vendor might need. Mobile food vendors are particularly affected by this because they may do business in several different locations in a single day. Driving your food truck across county lines can change the requirements for licensure or require a separate license. Once you’ve found the right area of the website, you need to find out about the eligibility requirements for a license from the government. Then, you need to find out about the process. Remember, all of the details may vary depending on which government entity you want to get your license through. Which Food Vendor License Do I Need? 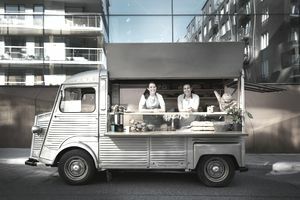 Depending on the municipality you need to go to through, you might have several types of food vendor license available. For example, sometimes there’s the option for a temporary license. This would be needed for situations where your business will only be selling food for a limited time, such as a single festival or street fair. You might also have the option of a restricted food vendor license. These restrict sales to a certain area of town or on certain property, such as a public park or commercial area. On the other hand, unrestricted licenses allow sales in all locations with no restrictions. In some places, a food vendor license might be limited or unlimited. Limited licenses only allow you to sell prepackaged food and have less strenuous requirements for health inspection. Unlimited licenses allow you to sell both packaged and prepared foods. The permit fees can vary on these two licenses so it might be worth it to pursue a limited license if it would cover your business’ needs. Some municipalities have separate food vendor licenses for individuals and their trucks or carts. For example, New York City distributes a license to the vendor himself that shows a photo of the vendor and his permit number. But if he is using a cart, that license is a separate application process and fee that comes with a sticker to affix to the cart. Although the application process can vary depending on where you want to use your food vendor license, there are some universal steps across the board. First, you’ll need to get the application from the website of the municipality you’re hoping to operate within. Fill it out completely. It’s going to ask you information about your business structure and the facilities you plan to sell your food out of. If it’s a permanent physical location, the application will ask for the address. If you have a mobile unit you’re using, the application will likely ask you for your proposed location schedule. In larger cities, there may be a limited number of food vendor licenses available at any given time. In theory, this keeps the industry competitive yet prevents overcrowding. If you want to operate in one of these municipalities, it may be very difficult to get a new permit. Sometimes, there might be a long waiting list, but in some cases, there will be a lottery you can enter. When you complete your food vendor application, you will likely have to pay the application fee at the time of submission. Once your application has been reviewed and approved, you’ll need to pay the permit fees before you receive it. Most permits are good for a year and then you’ll need to renew them. That process can vary too, but it generally requires you to fill out a renewal application, pay any fines you may currently have, and then pay the renewal fee. In most cases, the renewal fee will be significantly less than the original permit fee. Your food vendor license will probably come with a health department inspection of your facilities or unit. Depending on the process where you apply for your license, you’ll either need to report to the local health department building at your appointed time or the inspector will come to you. The inspection will just make sure that the local food handling laws are being followed. For example, you might have to have restroom facilities available in the area where you are selling. The inspector will likely want to make sure that food items are being stored at the correct temperature. Another common check is that you are not selling any food prepared outside of the location being permitted or any food that is outside the scope of your permit. The health inspection is generally a separate fee from the license fee. You’ll need to pay it when you schedule your appointment or send your request for inspection. If your business does not pass the health inspection, you’ll need to schedule or request another one as well as pay for the re-inspection. This articles on the Small Business Administration website provides more tips for getting licensed as a food vendor or concession.